Have you ever wondered what a camel has got hidden inside its hump? Some people say it’s just for storing water, but we’ve got a sneaking suspicion there might be more going on in it. Now It could be time to find out the answer to that question… you never know, it could be filled with some serious cash! 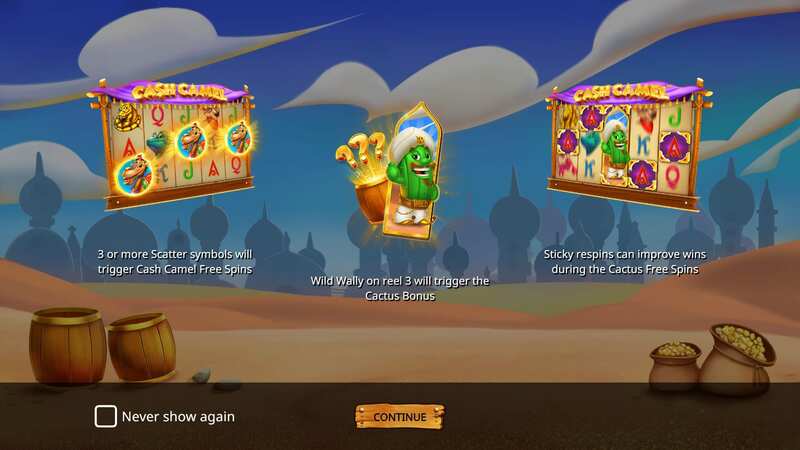 The new online slot Cash Camel takes you to the middle of the desert where you will meet an adorable camel and his moustachioed cactus friend. They are all ready with the reels and the pay lines – it’s time to spin and see if you’ll have any luck out in this sandy land! Once you arrive in the arid landscape, you will see plenty of sandy dunes and the silhouettes of a few buildings and temples off in the distance. Standing before you will be the main game board and your new pals, the camel and the cactus will be standing either side. It looks like they’ve made the board themselves out of some wooden poles and carpets, and the game’s title sits on a purple carpet covering the top of the board. There’s certainly a lot going on in the graphics of the game, and that’s no different when it comes to playing it. You’ve got five reels and twenty-five pay lines, and a whole bunch of exciting bonus features. The lower-value symbols in the game are represented by letters of the alphabet while scorpions, geckos and coyotes are just some of the desert creatures that represent the high-value ones. · WILD SYMBOL – Keep an eye on the little cactus fellow because he is this game’s Wild symbol. He will help increase your rate of success and can replace any simple apart from the Scatter. 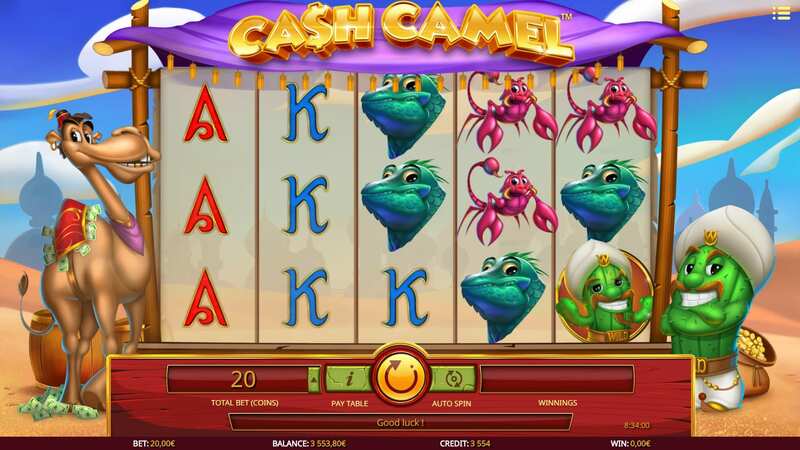 · SCATTER SYMBOL – The camel character represents the Scatter symbol and could bring you some free spins. If you manage to land three camels on the board, you’ll get ten free spins. Four camels bags you twenty and thirty free spins come with five camels. If you spin a camel during a free spin, you’ll get an extra bonus one. Cash Camel is a busy game with plenty going on in the animation and gameplay. It’s feature rich, which not only makes for a fun slot game but also helps to increase your chances of winning with every spin. Looks like it might be time to book yourself a trip out to the desert – you could come back with a lot more than just a tan and some crummy souvenirs! If you enjoyed Cash Camel, you can try out Rainbow Wilds.